Wedding program layouts can vary by designer and can include a few different things. These days programs can come in all shapes and sizes, including fan-shaped for the hot summer months. While the shape may vary, the content is pretty consistent. There is some information that you will want your program to contain about your ceremony and the important people in it. 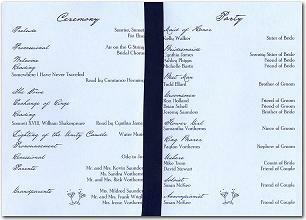 The wedding program layout we are going to describe is from InvitationConsultants.com. If you would like more information about this wedding program, click on the image below. To see the inner panels, click on 'Alternate View'. The cover of your wedding program contains introductory information about your wedding ceremony. The example we are looking at here actually has an overlay, so nothing is actually printed on the first layer. The overlay is transparent allowing you to see through to the cover. 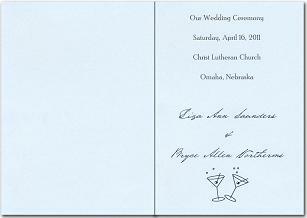 The cover will typically have the date along with the name of your church, temple or ceremony location. Your names will be printed on the cover as well, typically in a font that is different than the rest of the text so it stands out. Many programs will also have an image or design on the cover or first inner panel. In this case the design is two martini glasses, but it can almost any design that matches your wedding colors and theme. The cover may also contain ribbon or string to tie the program together. The left inner panel will typically include ceremony information, like the music used for the processional and recessional and any readings you are having during the ceremony. It can also include your parents and grandparents, as in this example. The right panel typically includes the wedding party, ushers and any musicians performing during the ceremony. Sometimes programs will contain detailed information about the wedding party which includes how they know you and any other funny comments about them. The image or design is carried through the entire program and can be seen at the bottom of each page. The back of a wedding program can also contain information sometimes. A thank you to your guests or a remembrance of a parent or other loved one that isn't there to enjoy your big day can sometimes be found on the back. Not all programs contain any writing on the back, and the one we are highlighting above does not.